WordPress Website, Blueprint Magazine - NOYO Web Development Inc. The NOYO team helped my company create several websites this past year and they were hands on from start to finish. We discussed what I needed in the website functionality and as well as my design vision, and I was provided with several ideas on how to accomplish it. The designs are beautiful and intuitive, the work was completed on time—and because it’s WordPress the sites are easy to manage on the backend. NOYO’s customer service is second to none, which is why we keep coming back for new designs as our business grows. Blueprint is a new type of media company focusing on the construction industry. Neither strictly a publication nor a marketing firm, it provides salient, entertaining stories that serve the dual purposes of disseminating new ideas and promoting the brands that are most often the focus of its stories. 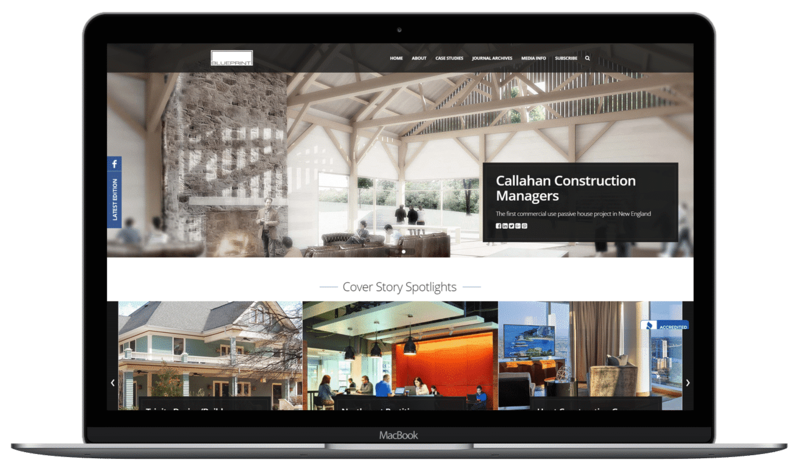 Written for and about general contractors and specialty contractors, architectural and engineering firms, developers and manufacturers, Blueprint enables these groups to connect and share their stories online, on our blog and through social media. Candid discussion is front and center here—of green building, wellness, safety practices, diversity, recruitment and retention, and more. Launched in early 2017, Blueprint has the backing of established TrueLine Publishing LLC and its vibrant staff. The Portland, Maine-based company is known for being one of the best places to work in the state and is the umbrella company for numerous award-winning publications on wide-ranging topics. Since being founded in 2009 our longevity in the web design industry and repeat business is positive proof of our commitment to delivering outstanding results over the years. We’re a dynamic team of problem solvers and critical thinkers who enjoy a challenge which you will quickly sense when speaking with any member of our team. NOYO Web Development Inc. helps your business grow by providing exactly what you need, within budget, on time.